Note: Passenger & freight steamer. First compound engine built on Great Lakes. Burned while moved to breakwater; total loss. 1868, Sep 7 Enrolled Chicago, IL. 1872, Apr 23 Enrolled Erie, PA; owned Erie & Western Transportation Co., Joseph Potts, president. Purchased $75,000 to operate Anchor Line between Chicago, IL & Buffalo, NY. 1873, May 9 Collision with B. W. BLANCHARD above St. Clair Flats; sank with flour & wheat. 1873, May 15 Raised; repaired Detroit. 1877, Apr 26 Enrolled Erie, PA; 2 decks, 1 mast; 677.59 gross tons. 1879, Apr 26 Enrolled Erie, PA; vessel altered; fore & aft cabins united; 924.21 gross tons. 1882, Oct Explosion, barrel of carbolic acid, Duluth, MN. 1887, Nov 17 Burned & sank Marquette, MI; carrying oil & acid; salvaged Reid. 1888, Sep 13 Enrolled Port Huron, MI; rebuilt Dunford & Alverson as steambarge; 1 deck, 3 masts, steel arches, steel boiler house; 189.4' x 32.5' x 13.4'; 684.38 gross tons/475.57 net tons; owned Walter Young, Bay City et al. 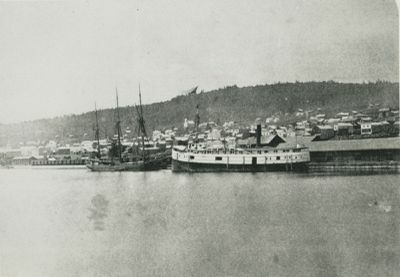 1888, Oct Newspapers erroneously reported name change to CITY OF MARQUETTE. 1891, Feb 7 Owned Young Transportation Co., Merritt, MI. 1893 Rebiult & re-engined, steeple compound 22 + 40' x 30"; 500hp, 96 rpm, Marine Iron Works, Bay City, MI. 1893, Apr 17 Enrolled Port Huron; 3 masts, changed tonnage 765.03 gross tons/601.06 net tons. 1902, Dec 29 Enrolled Cleveland, OH; owned Gray Transportation Co., Willoughby, OH. 1906 Owned White Transportation Co.
1909, May 12 Owned James A. White, Buffalo, NY. 1916 Owned Twin City Transportation Co., O'Hagan, president. 1918, Feb 25 Owned John J. O'Hagan, Tonawanda, NY. 1918, Apr 5 Owned Runnels Steamship Corp., Buffalo, NY. 1920, May 5 Owned Alexander MacDonald & Michael J. Griffin, Oswego, NY. 1922, Dec 1 Destroyed by fire; oldest freighter on Lakes.